​to hear about upcoming events! 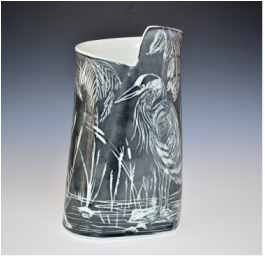 ​ Elaine Shore works almost exclusively in porcelain, creating beautiful, hand-carved and hand-painted, functional and durable pieces. 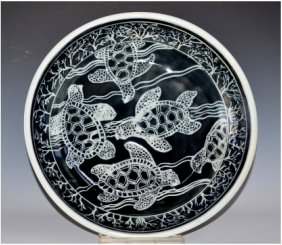 She uses the surface of her pieces as her canvas, carvin gand hand painting nature-inspired designs freehand on her clay. Her pieces, although they look delicate, are very durable and are microwave and dishwasher safe. The carvings on her mugs, bowls, serving platters and vases are done using a process known as sgraffito, which comes from an Italian word for scratching or carving a design through colored clay or “slip” that has been brushed on the piece. Sometimes she adds a touch of bright accents of color to her pieces and sometimes paints and carves directly onto the white porcelain surface to create colorful painted designs. ​ Most of her favorite designs are derived from nature: flowers, birds and animals. “It is important to me to be able to create art that is useful, yet beautiful and durable, so that it can be used every day”. Her pieces, although they look delicate, are very durable and are microwave-and dishwasher safe. 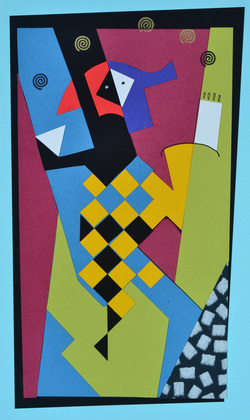 ​ Barbara Wright began making mosaics in 1999. She attended the Sculoa Arte del Mosaico in Ravenna Italy in 2002, learning the old techniques of mosaics. 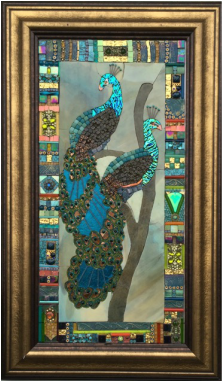 There she was inspired by modern works in the old style and began creating two- and three-dimensional pieces using art glass, Smalti, millefiori, tiles and various artifacts. Each piece expresses her vision and environment, with many ideas originating from the beautiful coastal area of Trinidad, where she lives. 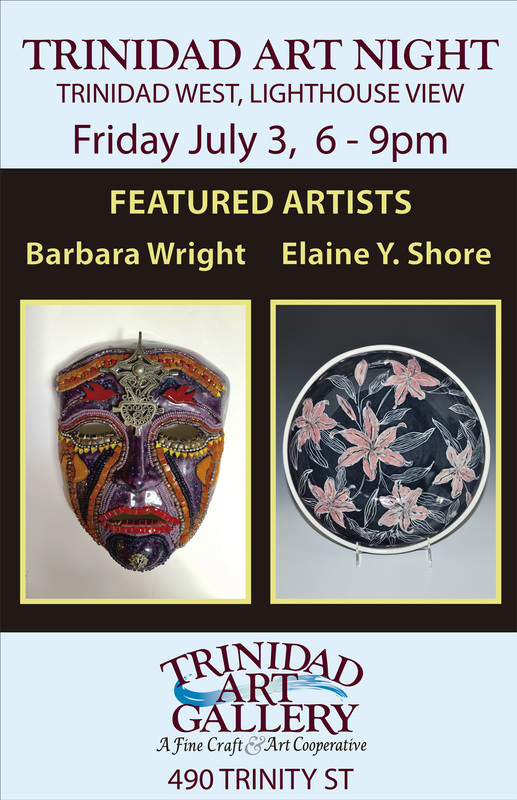 Trinidad Art Gallery presents two featured artists for the month of July, with an opening to be held on Trinidad Art Night, Friday, July 1, from 6:00-9:00 p.m. Raku potter Laura Rose and painter Shirley Nan Ruchong will have their works highlighted and will be present at the opening. For Trinidad Art Night, the entire town puts on a family-friendly celebration with music and food and a variety of activities for everyone. ​ "It thrills me to know that these most ancient humans are speaking directly to us in the only language they can, a language of art and love. It is so clear from the way they portray these animals that they held them in awe and in a deep love. They also tell us that art and a spiritual connection with nature has been an essential part of being fully human from the beginning of time." Rose also creates other kinds of raku, sometimes using horsehair to create fine black lines at random. She also uses glazes that contain copper and other minerals, and these turn out with greens, blues, purples and blacks shot through with copper tones in some degree or other, depending upon the whims of the kiln gods. She especially enjoys depicting whales and dolphins on these coppery vessels. To create raku, Rose must be covered with protective clothing, gloves, and eyewear to reach into the heat with long tongs to pick up and transfer pieces to a smaller container where paper is waiting to catch fire. When fire blazes, she seals it in to “soak” it in the smoke and lack of oxygen that works its magic on the hot clay pieces. 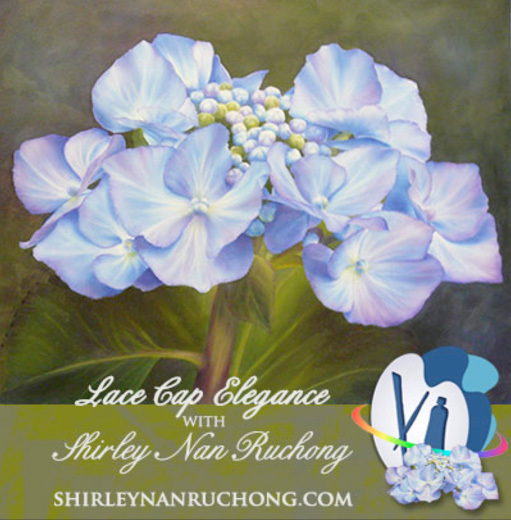 Painter Shirley Nan Ruchong says, "I love oil painting in high-contrast and find the most enjoyment in painting flowers in a contemporary realism style. There is great joy in exploring all the intricacies that God created as well as discovering all the colors He used!" She loved art from childhood, but not until well into adulthood was she introduced to the Tole Painting that changed her life. This is an art form that is taught as "how-to" - no previous talent necessary and traditionally painted on functional surfaces. From that time until now she has pursued art, taking many classes and from many teachers. ​ Ruchong has elevated the simple art of Tole to her own level of amazing detail and realism on beautiful oil paintings. She lives with each work for several weeks, painting it in as many as five or six layers. By investing this time to evaluate her painted surface to make sure the design is developing her vision, she is able to achieve a stunningly realistic look. She has seen viewers of her work actually reach up to the painting to try to wipe away one of her dewdrops! Her greatest pleasure is to see the smile that her flowers bring to the faces of her audience. Ruchong also paints in watercolor and acrylic. Her newest love is alcohol ink. It is very freeing and allows her to paint in more of an abstract style which is a nice change for this artist from the more rigid and time-consuming realism. Alcohol ink is a permanent dye mixed into an alcohol medium. The nature of alcohol ink is to blend. The colors, when placed on a surface, will spread out and, when they meet, create another color. Due to this serendipitous quality, nothing can ever be duplicated exactly so all pieces are completely unique. At the Trinidad Gallery these colorful landscapes are done in several sizes on a special kind of non-porous paper. (707) 677-3770. 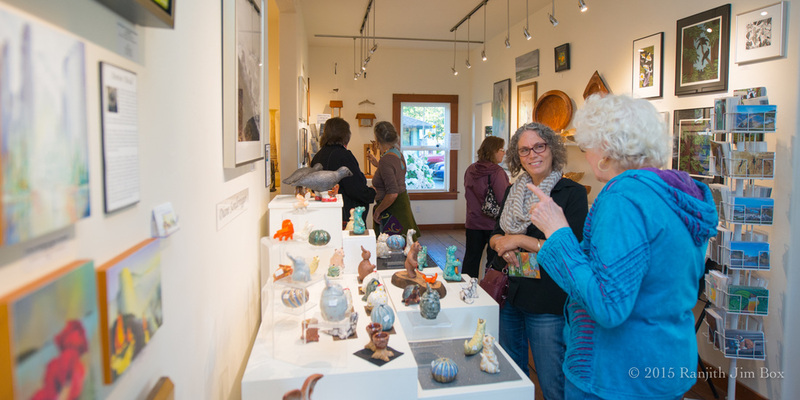 The public is especially welcome to visit the gallery on Trinidad Art Night, Friday, July 1, 6:00-9:00 p.m. when there will be an opening hosted for this month's artists, Laura Rose and Shirley Nan Ruchong. The cooperative Trinidad Art Gallery is highlighting the work of mask maker Donvieve and artist/writer Susan Mayclin Stephenson this month. 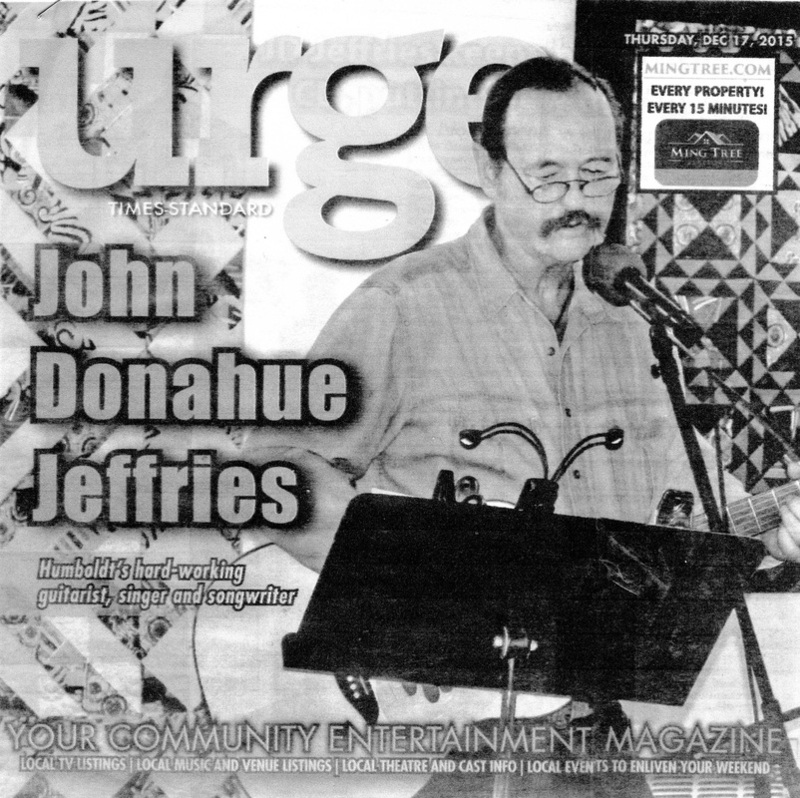 An opening reception is planned tonight during Trinidad Art Nights from 6 to 9 p.m.
Donvieve is a well-known local artist and teacher of mask making. She specializes in making masks for performance and often works with elementary and secondary school children. She believes that masks have remarkable potential for healing. Stephenson has traveled in more than 60 countries. Her artwork and her writings about cultures of the world and the education of children reflect this experience. Her watercolors, drawings and oil paintings can be found in homes on six continents and her books have been translated into several languages. 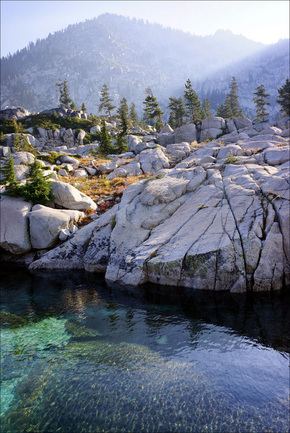 When Stephenson returns home to Humboldt from her work abroad several times a year she is continually struck by the natural beauty of this area. She has recently begun to include local images in her paintings. For more information, go to www.susanart.net. Also on display this month is the work of 20 other members of the cooperative gallery. 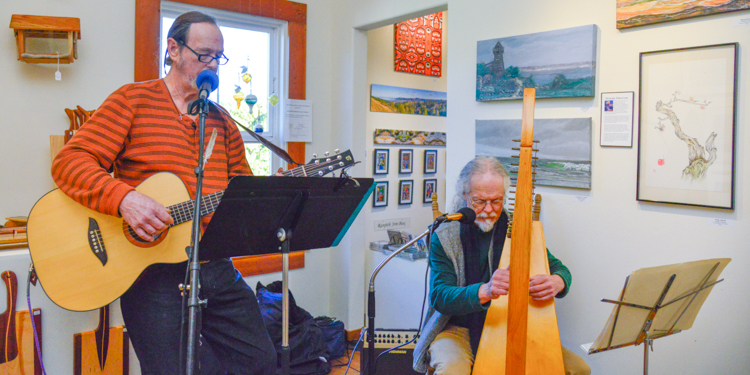 Tonight’s reception will include music The Secret Club, a Trinidad group of three acoustic guitarists: Michael Stephenson, Ric Replogle and Jeff Provolt. There will also be complimentary food, and adult beverages are poured for a donation. 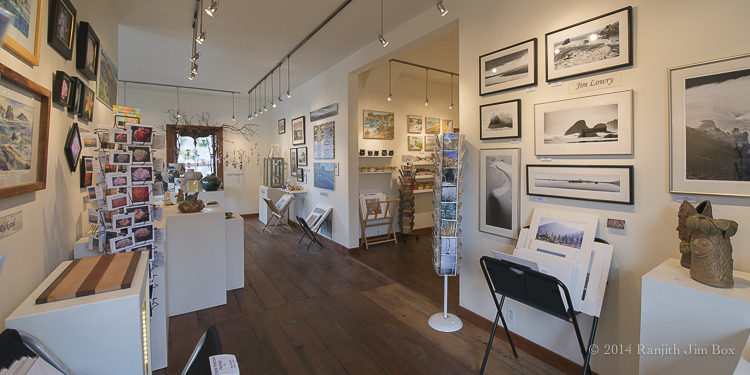 The Trinidad Art Gallery is located at 490 Trinity Street. For more information, call 677-3770 or visit trinidadartgallery.com. The cooperative Trinidad Art Gallery is highlighting the work of woodworker Kurt Hellmich and digital photographer Ranjith Jim Box this month. An opening reception is planned during Trinidad Art Nights tonight from 6 to 9 p.m.
Hellmich grew up in the San Fernando Valley where his father was a cartoonist for Walt Disney back when they still drew their animation by hand. It was natural for Hellmich to follow his father’s pattern of making a living through art, but instead of being called to drawing he pursued his love for working in wood. At first, Hellmich worked with cabinetmakers, spending a dozen years learning their craft. When he came to the North Coast in 1979, he quickly developed a fascination with one of the most natural sources of wood in our area — driftwood. Throughout the early 1980s, he repurposed driftwood into clocks and tables, marketing his work in Los Angeles. Today, Hellmich also uses fine wood products, but still enjoys adapting recycled woods from deconstructed barns and driftwood. 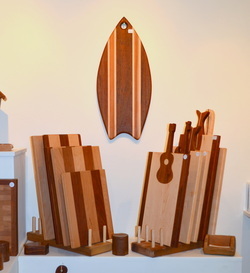 His work includes cutting boards with inset images as handles, cribbage boards from driftwood shapes, and birdfeeders. Box is a nature photographer who adds a unique quality to his work through a type of digital manipulation that he calls “mirrored neurons.” He has been evolving this technique for over a dozen years and, in 2015, one of his pieces won a first place award from the Redwood Art Association. Box’s technique brings every part of the scene into perfect sharpness, just as the human eye sees it in person — a tree has every single leaf and branch in perfect focus and in his landscapes, the far mountains have as much clarity as the nearby trees and flowers. Box prints his photographs in many sizes, but is especially fond of large, frameless images. His work has been on display this year in the Trinidad Art Gallery’s auxiliary gallery in the Sunset Restaurant of Cher-Ae Heights Casino. “I love nature photography and derive great joy and comfort being in nature. It heals my soul,” he said. 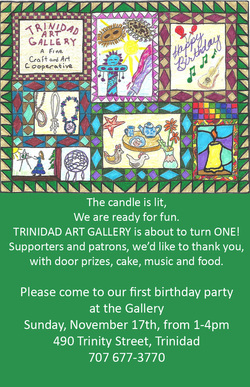 The Trinidad Art Gallery is located at 490 Trinity St. For more information, call 677-3770 or visit trinidadartgallery.com. 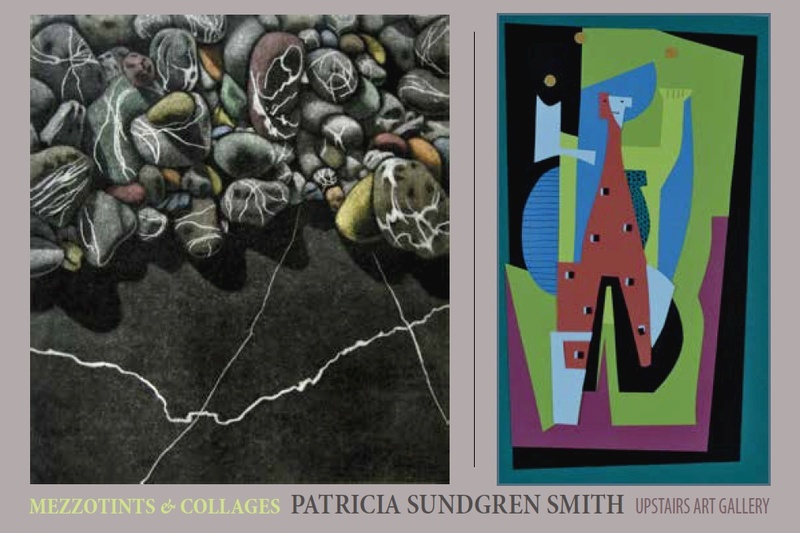 The Trinidad Art Gallery is featuring prints by Patricia Sundgren Smith and woodwork by Tom Kingshill throughout April. The cooperative gallery is open seven days a week from 10 a.m. to 5 p.m., with one of its artists always on duty to talk with visitors. Along with Smith’s ongoing printmaking works, two new series of her artwork are on display this month — one featuring birds and another of abstract relief prints made by applying ink to a brayer and then running it over soft printmaking paper under which are textured surfaces. The series, called “Syncopation,” was created in a single day while listening to syncopated jazz. 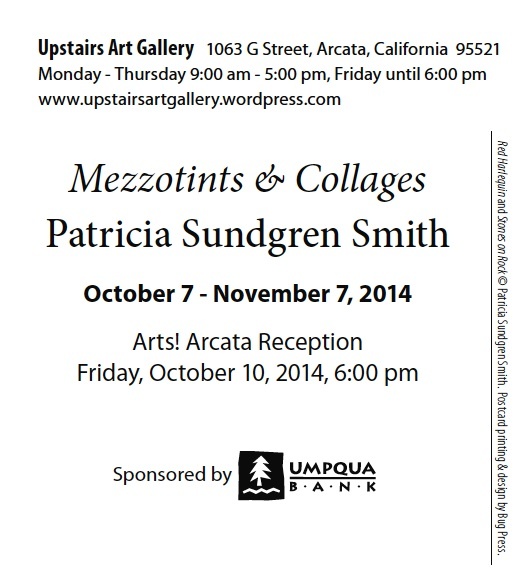 Smith came to the local area in 2012 from San Francisco where she was very active in the printmaking community. She served on the board of the California Society of Printmakers and her prints were displayed in a number of shows and galleries in the Bay Area, as well as across the country and in Belfast, Northern Ireland and Amsterdam in the Netherlands. She has won a number of awards, including one by the curator at the Museum of Modern Art in New York City. Smith’s prints demonstrate a variety of techniques and subject matter. The artist typically focuses on a single topic for an extended amount of time. These have included, but are not limited to, goddess forms, shorebirds, tribal imagery, rocks, seashells, women in kimonos, the redwoods, ravens and koi. Kingshill is a local woodworker who is inspired by lumber of the North Coast landscape. Using a wood lathe, he takes foraged sections of local trees and creates decorative vessels for the home. He specializes in natural-edge bowls. These vessels challenge the artist to practice a fine-tuned discernment of formal qualities on design while leaving the edge of the piece wild. The elements of smooth, machine-like precision and natural, raw undulations of the untamed surface of a tree come together in the form of a unique bowl. Kingshill was born into a family of carpenters. At an early age he became familiar with woodworking techniques and has spent his life exploring various techniques and products. 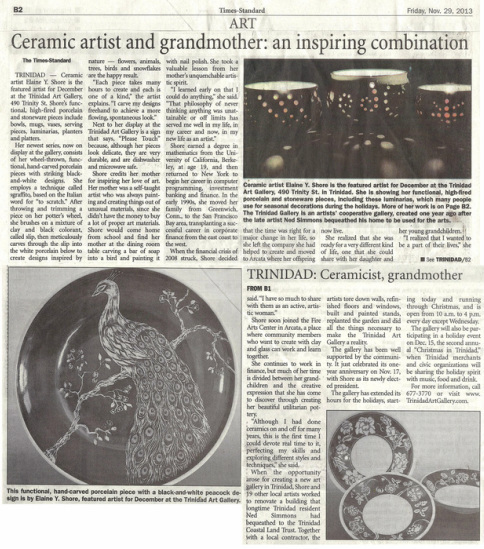 Represented in the Trinidad Art Gallery are his candleholders, wine stoppers and a creative array of bowls and platters. Kingshill’s latest focus has been in the skill of woodturning. He says that there are few other techniques in woodworking that can embellish the inherent beauty of the material. “When I turn wood I find myself driven by the unknown qualities of the wood,” he said. “I may begin with a simple wood block, but I am captivated by the fact that there is no way to know exactly what the piece will look like when it’s done. The work of these two artists can be seen along with the work of 20 of their fellow artists. 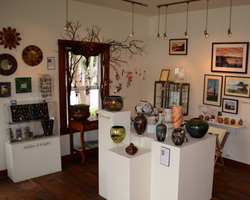 The Trinidad Art Gallery is located 490 Trinity St. For more information, call 677-3770 or visit trinidadartgallery.com. 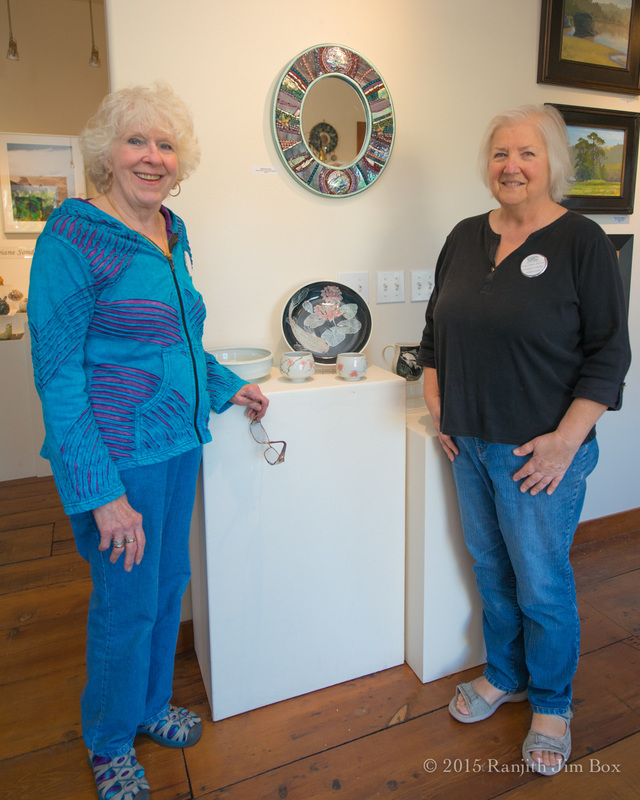 Printmaker Arlene Broyles and mobile sculptor Sarah Magnuson are the featured artists for March at the Trinidad Art Gallery. Their work is on display daily from 10 a.m. to 5p.m., along with the work of 25 other artists in this cooperatively run gallery at 490 Trinity St.
Broyles creates a kind of printmaking called monotypes. As the name implies, each creative process nets only one print. The artist paints her images directly onto a glass plate. When the image is transferred to paper the outcome is never certain and as the ink is transferred from glass to paper, the image becomes reversed. The transfer of ink from plate to paper always includes an element of surprise. Broyles’ creations run the gamut — from abstract to realistic. Color is an essential quality in her works, which have a clean, crisp vividness. Her prints are inspired by her life here in Northern California, often using her observations and impressions of the coastal environment. In some of her more recent monotypes, she has been attempting to capture the reflections of light on water and wet sand. Magnuson is a founding member of the Trinidad Art Gallery. She creates mobiles that bring together such elements as hand-blown glass, wood, stone and dried plants, all enriching the image of central copper figures of fantasy, such as mermaids, fairies and such. Her works usually include an array of small, long obsidian stones at the bottom that serve to make a soft sound. Magnuson has been working in metal arts since the age of 13, when her father challenged her to make a headdress of better quality than the one she had begged him to buy her at a renaissance fair. 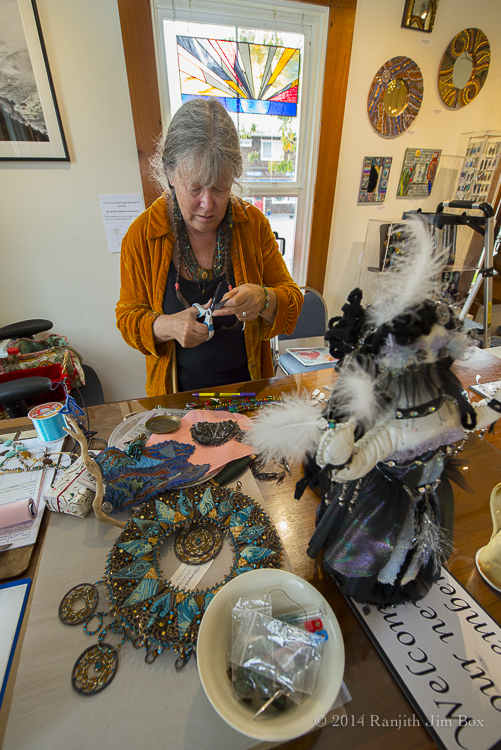 She eventually developed her own business, Fantasy Lane Copper Fairies, after six years of studying in Humboldt State University’s Art Department. Her fairy wings are modeled after herbs with medicinal properties and her sculptures are accompanied by a storybook describing the fairy lore as well as the healing plant depicted. For more information about the exhibit or the show, call 677-3770 or visit www.trinidartgallery.com. ​ A new member and a founding member are showing work this month at the Trinidad Art Gallery, 490 Trinity Street. Fabric artist Patty Demant is the gallery’s newest member. She is a featured artist for February along with longtime member Jim Lowry. Demant creates scarves characterized by natural colors, natural fabrics and the shapes and textures of a variety of leaves. Her special process, actually an ancient fiber art from Australia, is now called eco printing. It works only on natural fabrics such as silk, wool and cashmere, and is a multi-step, two- to three-day event. For other natural materials such as linen, cotton, and hemp, it can take weeks. The process begins by wrapping fiber bundles around leaves, such as eucalyptus, alder, maple, oak and black walnut, and binding them tightly around copper pipes. The next step requires a pot full of elements to serve as mordants, such as iron and vinegar. These bundles are simmered for hours, then removed, cooled and opened the next day. Every element of her process has an effect on the final product, even to the hardness or softness of the water, said Demant, who now uses rainwater. Demant has been working with fabrics since childhood. She learned to use a sewing machine, putting quilts together and sewing her own clothes, at age 13 and has not stopped since. In her professional life, she followed her heart into early childhood education, founding the first Montessori school in Humboldt County in Fortuna. She also worked at Gateway School. These alternative schools emphasize child-centered experiences, art and authentic use of language. In 2010, Demant retired from her 40-year career and returned to her passion for cloth. She was introduced to eco printing by fiber artist India Flint. Demant fell in love with the process. "I will never look at a leaf without wondering if it will print,” she said. ​ Lowry’s limited edition digital prints are collected internationally, and he has won a number of awards for his photographs, including Photographer of the Year and a second place award for landscapes in the International Panoramic Photography Contest. For more information about the exhibit, call the Trinidad Art Gallery at 677-3770 or visit Trinidadartgallery.com. Patty Demant, our newest Artist member at the Trinidad Art Gallery, is the featured Artist for the month of February. Patty does Ecoprinting on beautiful silk, wool, cashmere, linen, cotton and hemp scarves with natural earth tones. Come on down and enjoy her work, you'll love it. ​ Kathy O’Leary, a professional artist for close to 25 years, is the featured artist at the Trinidad Art Gallery for the month of January. An opening reception will be held Friday from 1 to 4 p.m.
A California native, Kathy is an oil painter who focuses almost exclusively on landscape. This exhibition, while including some larger pieces produced in her Eureka studio, will mainly highlight her smaller work, painted on location (en plein air) locally and during her travels through California, Utah and Colorado. O’Leary began her artistic life as a graphic artist, having been advised by a relative who was himself in the field that graphic arts was the only avenue by which an artist could earn a living. After a brief stint, O’Leary found that this was not the right path for her and she left the world of art to work in retailing natural foods where she helped develop and run the North Coast Co-op for some 20 years. Slowly, art began creeping back into her life. She found herself spending her free time doodling and playing with watercolors, realizing that not only had her drawing skills remained intact but that the hours she spent with brush in hand gave her a great deal of pleasure and a growing confidence. She began taking art classes and her pastime soon became her main focus. In the early 1990s, O’Leary decided, with encouragement from husband Greg O’Leary, to once more turn to working as a professional artist. 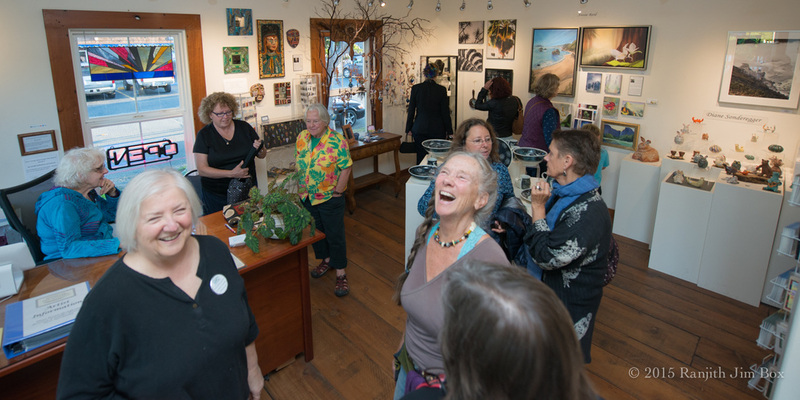 She created a studio in her home in 1994 and soon a larger space in Old Town Eureka. Concentrating on the medium of oil paints, O’Leary has been working there ever since. In her studio O’Leary creates her large canvases such as those that she has shown at the Morris Graves Museum of Art, working from her own photographs. More and more frequently, she finds herself drawn to taking smaller canvasses with her on location. She does some still life and figure work, but for the most part she is in love with interpreting a great variety of landscapes, with all the challenges brought by the ever-changing interplay of light, weather and seasons on the fantastic forms that nature displays. 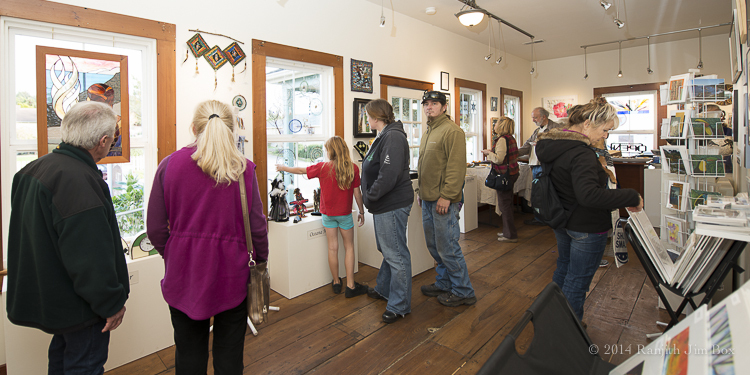 The Trinidad Art Galley is located at 490 Trinity St., just a few blocks before the lighthouse. O’Leary’s work will be featured alongside with work of 20 of her fellow artists in this member-run cooperative art gallery. 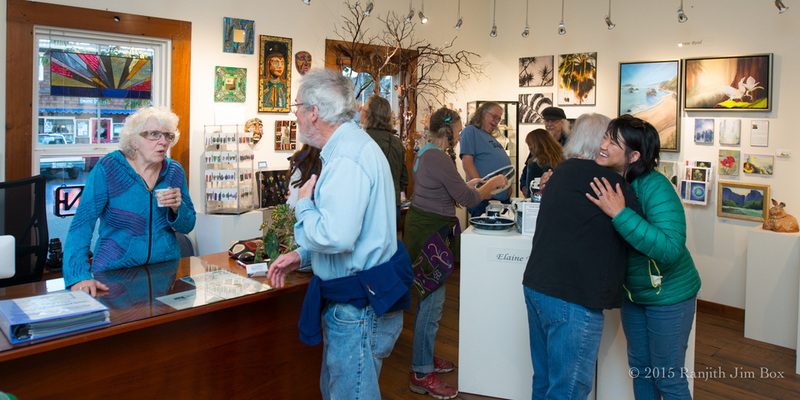 The gallery is open every day from 10 a.m. to 5 p.m. For more information, visit trinidadgallery.com or call 677-3770. 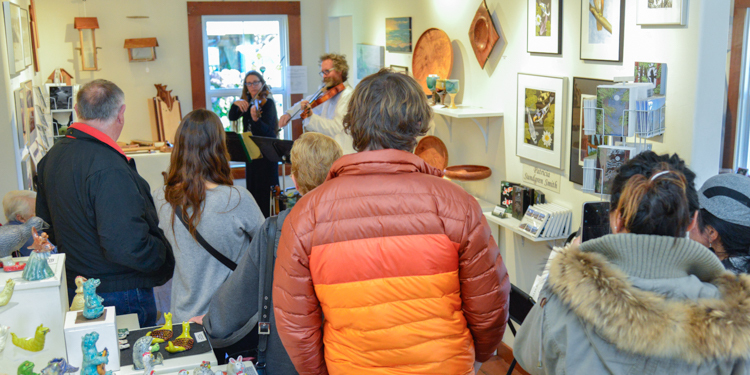 The Trinidad Art Gallery is featuring Oceana Madrone and Donvieve for the month of February. Both artists work with unusual elements to create their unique art, and both use their art to reach out to the community with teaching and healing. Donvieve’s art consists of masks, dolls and driftwood creations inspired by the cultures and the connection to nature of the many indigenous peoples she has visited. She has been influenced by her travels to places such as India, Bali, Japan, Mexico, and Central America, where she has taught classes to youth to encourage interest and commitment to their own native cultures. She has taught classes at The Ink People in Eureka, the Arcata Arts Institute at Arcata High School, as a California Art Council Artist in the Schools, and as associate professor at Marylhurst University in Oregon. An essential element of Donvieve’s work is the use of natural and recycled materials such as fibers, metal, clay, leather and wood to achieve her masks and other three-dimensional works. Recently, Donvieve has added her watercolors to her display at the Trinidad Art Gallery. 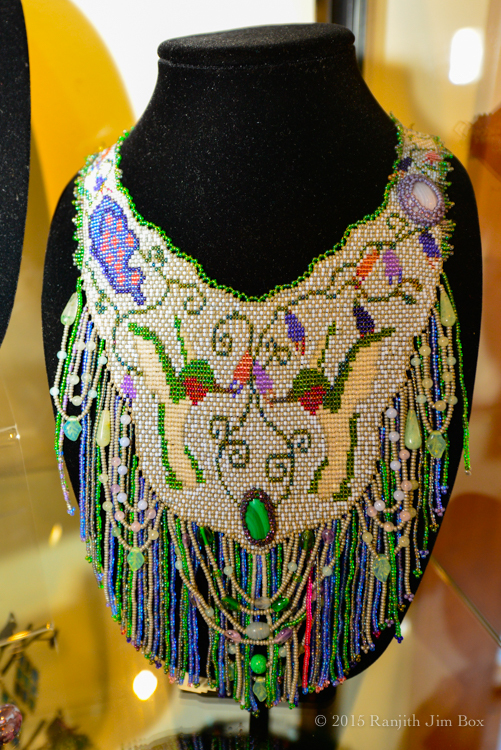 These colorful and lively pieces are also inspired by her travels, especially by the festivals and celebrations of native cultures such as Mardi Gras. 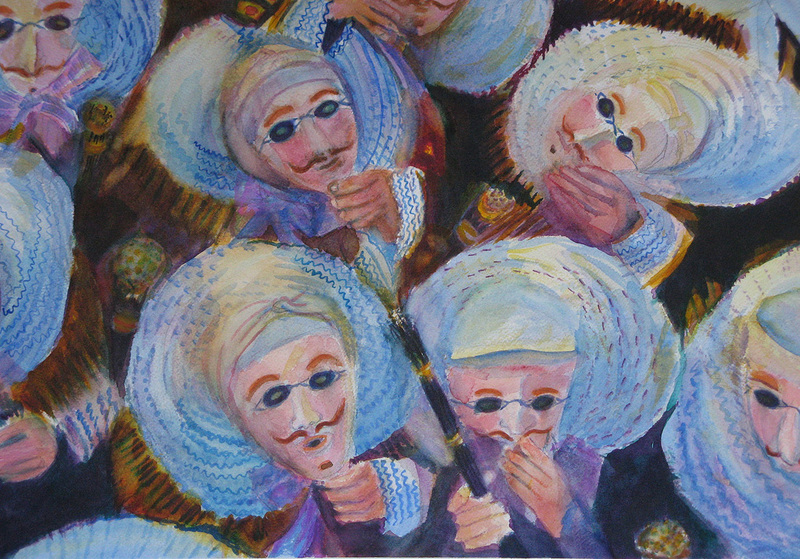 The work “Gillies” illustrates participants in the Carnival Binche in Belgium. Males, some as young as three years old, celebrate until late in the night on Shrove Tuesday, dancing and singing traditional songs and wearing the traditional garments of the painting. 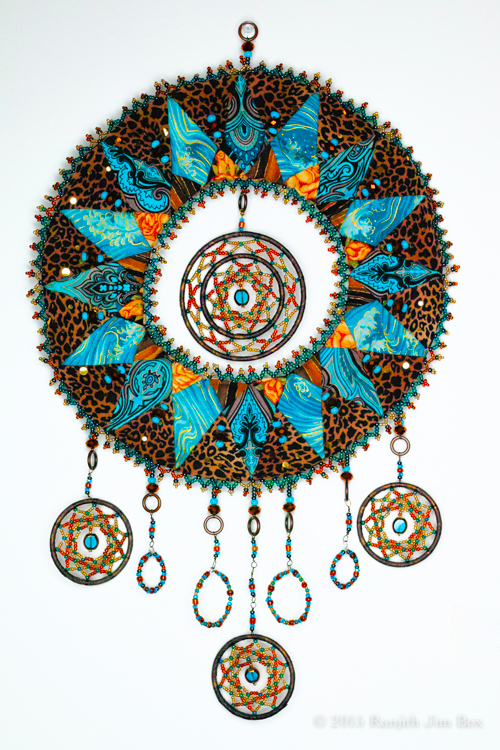 Oceana Madrone’s art consists of fanciful multimedia works of quilting and beading, stunning necklaces and other adornments of stylized beading. These elements have been part of her life from childhood. She was taught to sew at age seven by her mother who gave her a bead loom at age twelve. Her first bead purchase was a prodigious two pounds of blue and silver beads! Largely self-taught, Oceana has spent her life exploring the magical aspects of life in all its complexities. At her mother’s passing, Oceana embraced the healing power of art and was soon sharing her discovery with others who were dealing with domestic violence. She began working with Humboldt Women for Shelter, and soon the Healing Quilt Project was born from a desire to help women and children heal their experiences of violence, fear and pain. Over one hundred twenty quilts have been created by participants in two annual events: a yearly Eureka breakfast, “Stop the Violence, Start the Healing,” and “Native Women’s Wellness” in Hoopa. Oceana’s newest addition to the Trinidad Art Gallery has been a series of dolls, most of whom embody a particular characteristic such as strength or protection. Oceana says that they “come to me with a poem and their essential character,” and she brings that vision into existence as a doll. The poem then becomes part of the purchase of this art form. The way you made me feel so Special. When I cook & sew I remember you. When I hear music I remember you. When I wish upon a star you come to me. 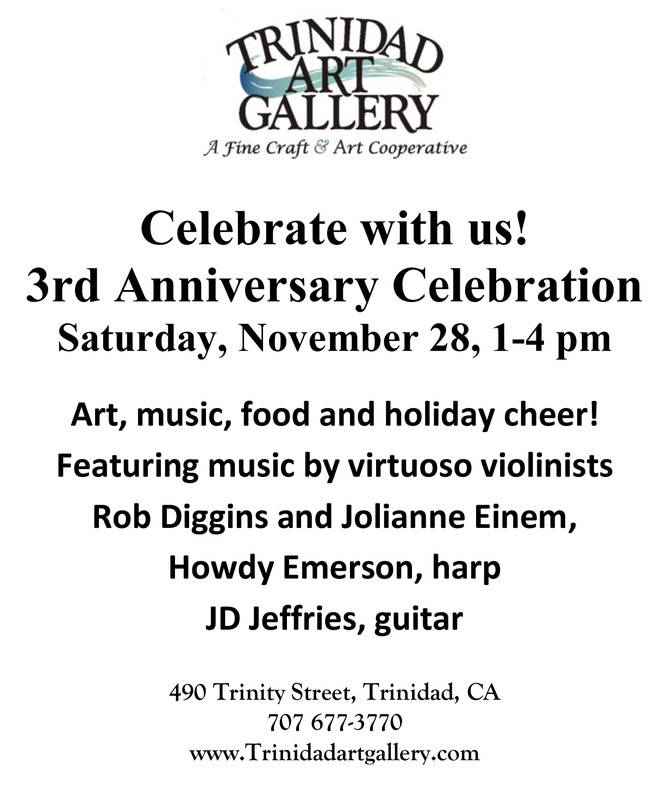 The Trinidad Art Gallery Celebrates it's 2nd Anniversary with food, fun, live music and a Holiday Gift Gallery. Howdy Emerson and JD Jeffries provided hours of live music. Keeping Gallery members busy sharing their work. Here Shirley Nan Rushong, Sarah Magnuson, and Patricia Sundgren Smith interact with patrons. 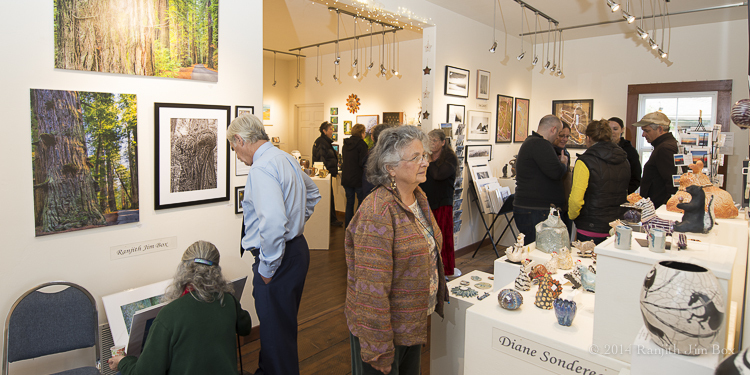 The Holiday Gift Gallery was a success keeping Barbara Wright, Elaine Shore, and Arlene Broyles busy at the register. Thank you everyone for attending and supporting your Co-Operative Trinidad Art Gallery. A good time was had by all! 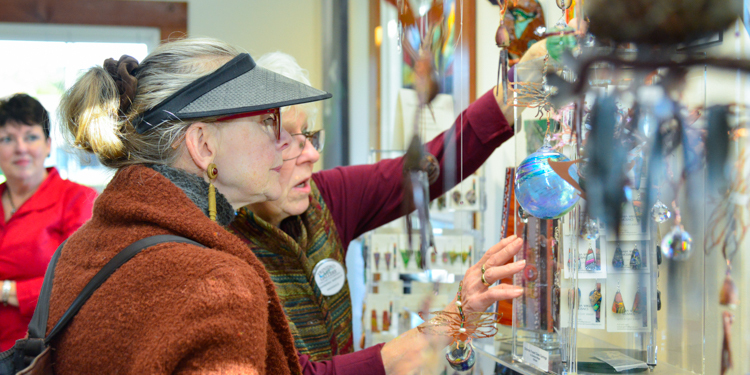 Kris Patzlaff and Amy Taylor spot and hang the Holiday Gift Gallery, while Oceana Madrone crafts more beautiful beadwork and fabric for the Gift Gallery and Howdy Emerson refreshes his Artwork. Wondering why the Trinidad Art Gallery looks so great, you're looking at it! We've created a space for live music by JD and Howdy and are looking forward to our 2nd Anniversary Celebration, featuring selected Artwork by member Artists. Come join us! Saturday, November 29th, 3-7 pm. 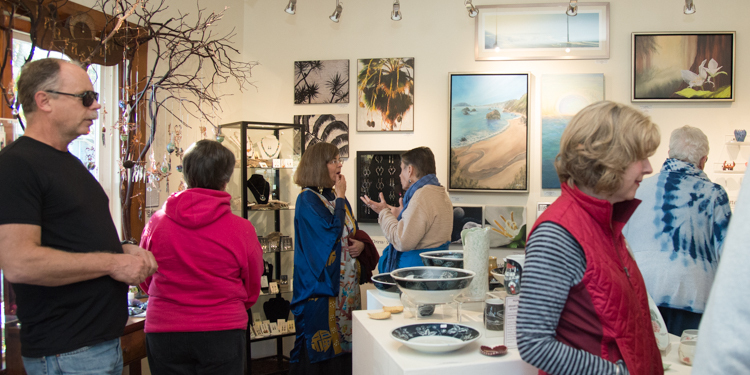 Join us as we celebrate ﻿Trinidad Art Gallery's﻿ Second Anniversary and newly expanded Holiday Gift Gallery, featuring personally selected artworks from our cooperative of regional artists. Saturday, November 29, 3 - 7 pm. Please, be our guests for Food, live music and beautiful art. 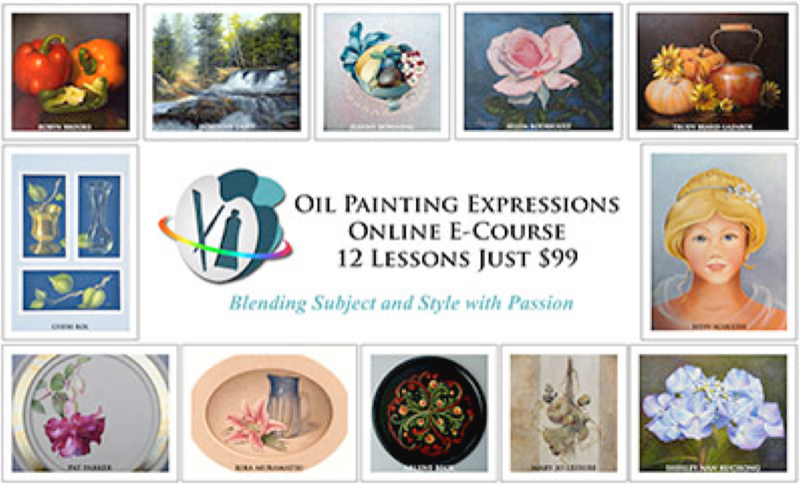 I am pleased to be able to share with you that I am one of twelve artists to teach on a new Online E-Course directed specifically to Oil Painters under the name of "Oil Painting Expressions". You will be offered 12 distinctly beautiful designs to paint. Your teachers are internationally known artists AND you have a full year to paint them! 1st Place at the 2014 Coast Redwood Art Association Photography Exhibition in Crescent City, CA. 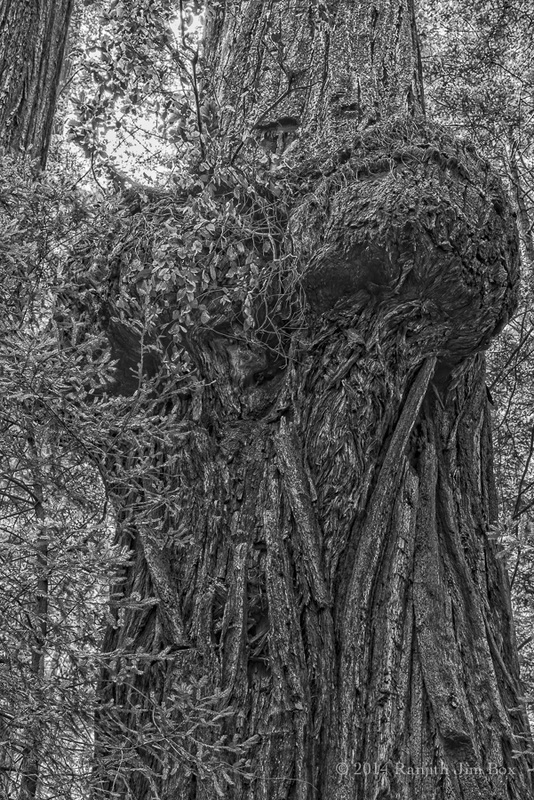 Ranjith Jim Box received 1st Place Award with Headwaters at the 2014 Coast Redwood Art Association Photography Exhibition, 140 Marine Way, Crescent City, CA. The Exhibition is showing from October 4-30, 2014. Judges comments: Our first choice is an example of “fine art” black and white printing. The quality of the print is flawless. Beyond the print quality the image has a presence. It exhibits a quality that created a connection to the essence of the subject, and it did so in a manner that may be realized by looking into the image. In other words, the image speaks. 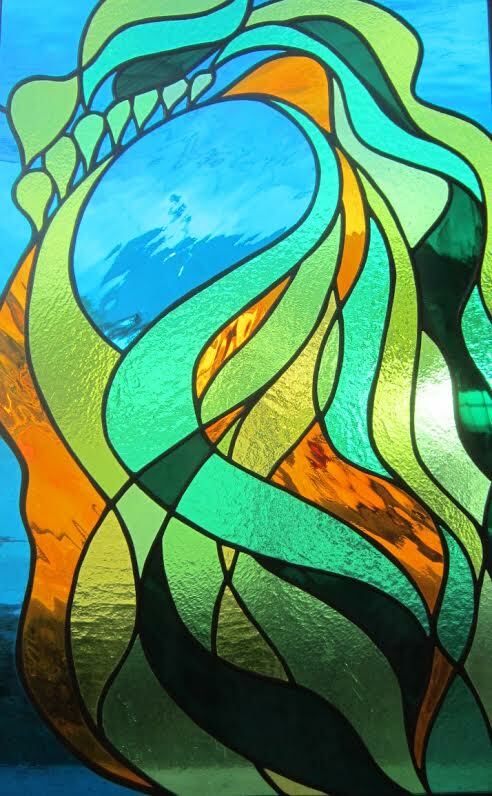 The Trinidad Art Gallery presents stained-glass artist Amy Taylor as its Featured Artist for September. Her work will be highlighted at the next Trinidad Art Night on September 5, from 6:00 - 9:00pm as part of town-wide celebration of summer nights. 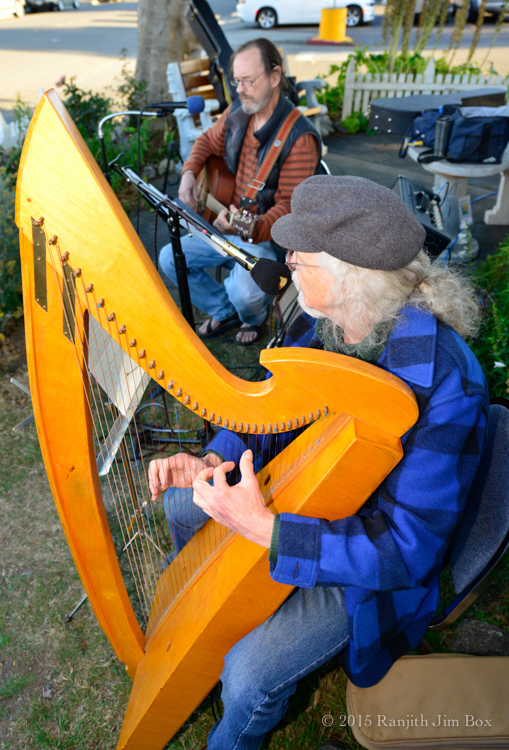 Amy was born and raised on the North Coast in the tiny town of Casper, between Fort Bragg and Mendocino and ended up in Humboldt County by virtue of attending Humboldt State University where she earned her degree in Fine Arts. Amy describes herself as an “accidental artist.” She took art on as her major because she thought it would be the most likely major to continue to enrich the quality of the time of her lifespan, but she did not see herself as becoming a practicing artist. In fact her specialty at Humboldt State in the field of art was a dying art form, lithography, the creation of prints accomplished by etching stone. She was not looking for a future in this esoteric field. Nonetheless, Amy kept finding herself rather accidentally working in the art world. As she took on a number of different jobs in order to save money for her future adventures, she found herself working with an old-fashioned hand-set printing press, and once again working with outdated technologies. She also found work in a framing shop and thus found her days surrounded by art. Amy's perceived goal during her high school and college years was to travel while she was young and to experience the world. She tested out of high school during her sophomore year and went straight to college. As soon as she graduated she took off for Europe, alternately traveling and working to earn enough money to travel some more. She visited the British Isles, Asia, Spain and Australia for varying lengths of time over the span of several years. While she did visit a number of famous galleries and museums, she says that her main interest was in experiencing the actual countryside and appreciating the unique colors and textures of each new venue. Amy's traveling era came to a halt when she met her husband-to-be on a trip home. He had just begun his engineering career. They decided to settle in Arcata, where they built the firm of Atlas Engineering and are now raising two children, Caroline at four and a half, and Lucia at one and a half. When Amy arrived in this county, she went looking for work and once again found herself in the art world. She was hired at “Lamps by Hilliard” in Arcata, where she learned the skills to build and solder quality heirloom light fixtures, skills that would serve her in her next “accidental” step into the art world. When a small group of local artists was working to start the Trinidad Art Gallery in 2012, Amy happened to have gone to high school with one of the founders, Tim Breed. Atlas Engineering had volunteered to help the new gallery members get the building ready for the public, and Tim knew of Amy's work with glass. He asked her if she would like to join with the first gallery members as a stained-glass artist. Always ready for a new adventure, Amy said yes, and the rest is, as they say, history. Amy's first piece of stained-glass sold during the first week of the gallery's opening, and her works continue to be a popular item. She describes the nature of her images as being inspired by the action of light's emergence and reflection. Rather than using the glass to try to represent a picture of everyday objects, she looks to images where the light is an active participant, such as sunsets, or the action of waves. She uses texture and overlaying of several colors to respond to the challenge of how to suggest the depth that cannot be manipulated in the same way that it can be done in painting and drawing. 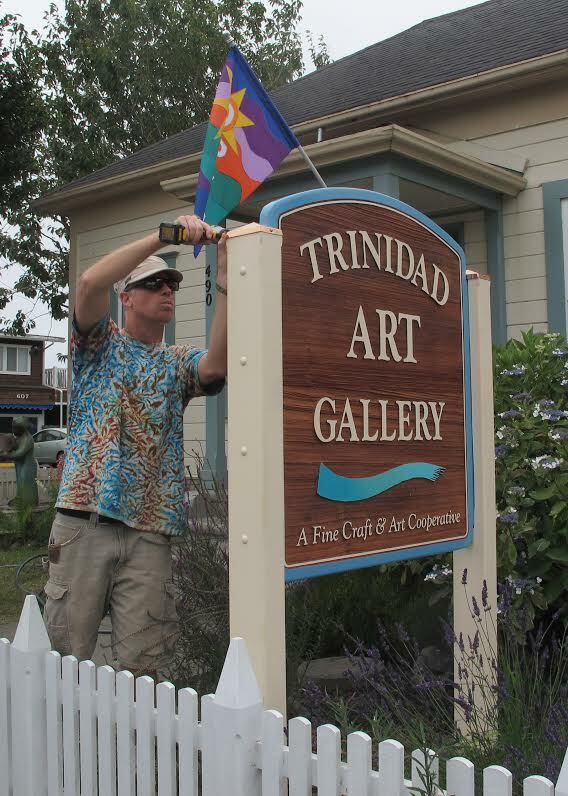 New Trinidad Art Gallery Sign Installed! The artists of the fine arts cooperative Trinidad Art Gallery have just completed their efforts to create and install a new redwood sign to alert visitors and community to stop in at their new establishment. 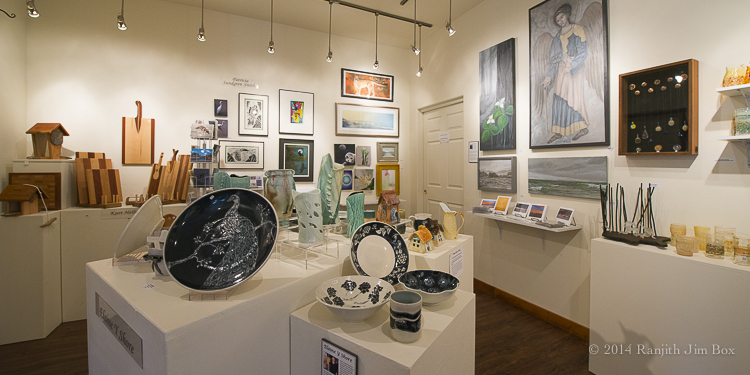 Several of the gallery’s artists, glassblower Wesley Hodges, photographer Jim Lowry, ceramics artist Elaine Shore, and Sarah Magnusson who works copper fairy mobiles, have been working together for the past several months to design a sign that would give this cooperative gallery a new identity and image. The building at 490 Trinity Street in Trinidad was formerly the home and art gallery of beloved Trinidadian Ned Simmons. When he passed away several years ago, he left the building to the Trinidad Land Trust in the hope that it could be used somehow for art in Trinidad. 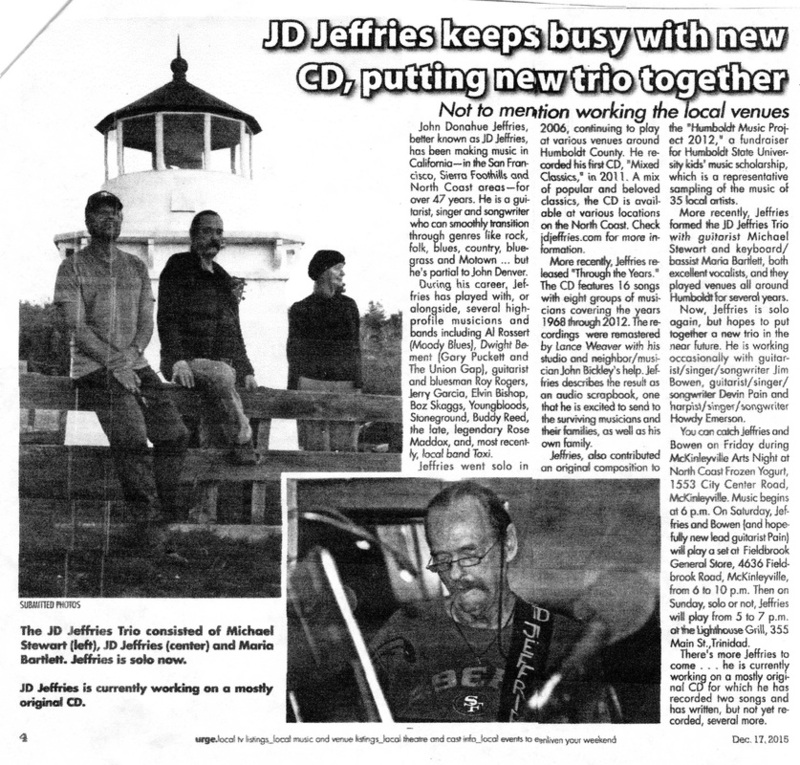 A group of local artists took up this idea and in the fall of 2012 they worked together to turn Ned’s home into a cooperative art gallery that could be ready to open in November of that year. 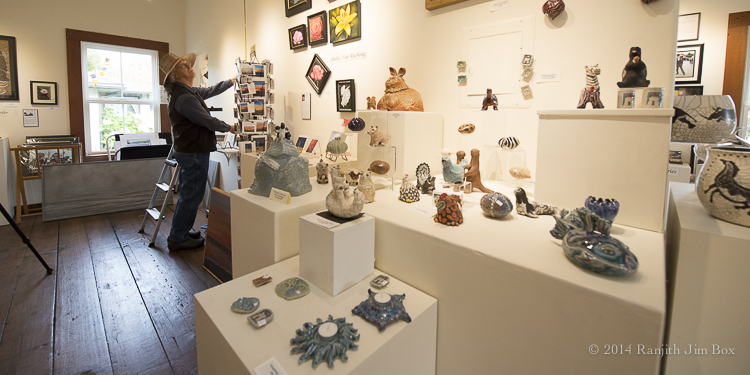 The members of the new art cooperative used their sweat equity to do everything from stripping and refinishing the walls to turning over the beautiful redwood floorboards to building and painting pedestals for display of their art. Starting with only a dozen members, The Trinidad Art Gallery has now grown in number to twenty-four artists who represent a wide variety of media. This summer, thanks to the ongoing cooperation of the Trinidad Land Trust, the members were able to expand the exhibition area of the building and they will soon be holding a Grand Reopening to celebrate with the Trinidad community that has supported their efforts. The new sign, constructed by Expo Arts Signs and Graphic Designs, replaces the one that Ned Simmons placed there when he used his home for a gallery and community meeting place. 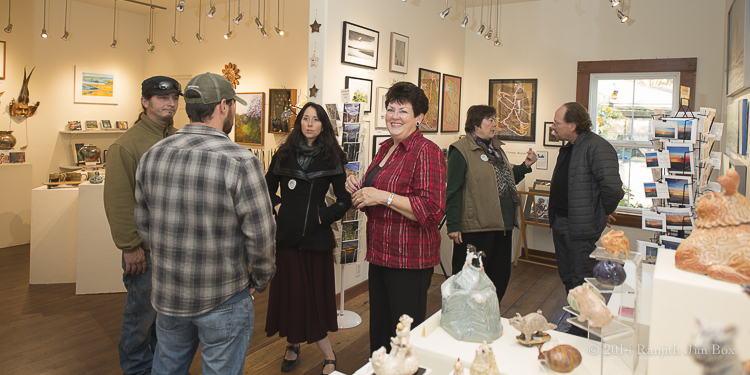 The new Trinidad Art Gallery hopes to carry on the tradition of being a vital part of the town of Trinidad. Trinidad Art Gallery is pleased to introduce Kurt Hellmich, woodworker, or as he calls himself, backyard artist. At this time in his life he is making fine wood items such as cribbage boards, cutting boards, wind spinners, boxes for jewelry and glass and wood birdhouses of various designs. Kurt’s wood art will be featured as part of Trinidad Art Night, Friday, July 4, from 6:00 p. m. to 9:00 p.m.
Kurt Hellmich grew up in the San Fernando Valley where his father was a cartoonist for Walt Disney back when they still did real animation drawn by hand. With a father who made his living through his art, it was natural for Kurt to follow a similar lifestyle. Kurt felt that he didn’t have an aptitude for drawing, but fortunately for us all, he did have an aptitude and a love for working in wood. Kurt started making wooden constructions as soon as he could use tools. In elementary school he won first prize in a model yacht building contest. In high school, Kurt began spending time with neighborhood cabinet makers. He worked his way into their studios, and ended up spending more than ten years learning their craft as well as developing a number of other construction skills. Kurt’s independent business allowed him to live in a number of places. 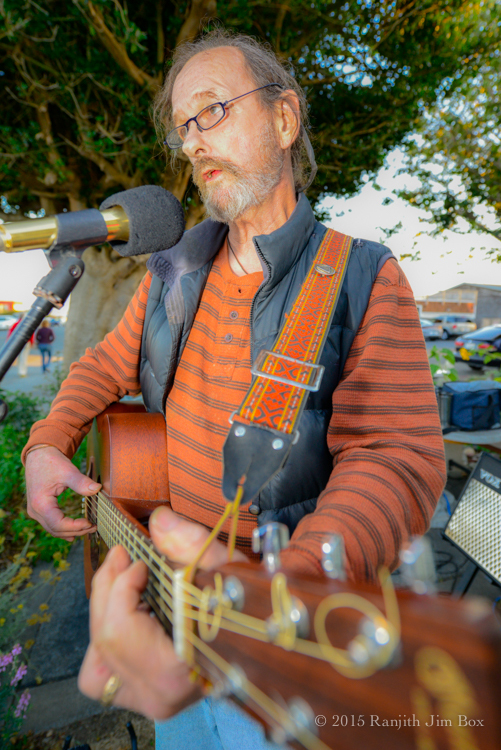 Just before coming to Humboldt county he drove to Alaska and lived there for a while. He has also lived in New York, Montana and Ohio. Kurt came to the North Coast in 1979 and quickly developed a fascination with one of the most natural sources of wood in our area, driftwood. Throughout the early 80’s Kurt gathered driftwood and made clocks and tables which he sold in Los Angeles. In his current focus on smaller items Kurt still uses many recycled woods from deconstructed barns, driftwood, discarded fence boards and other sources. He calls Humboldt his home with his wife Lynn Evers who is a local realtor with ReMax. Celebrate Father's Day in Trinidad. 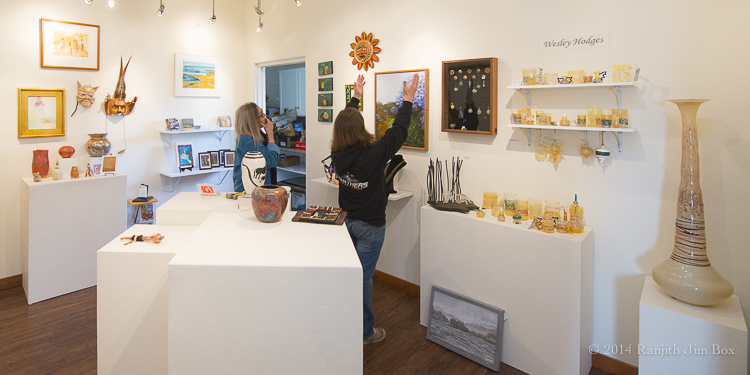 We will be open all day, so stop in and see our newly expanded cooperative gallery! Sunday, June 15th is the Trinidad Fish Festival. Held in town from 11-5, the festival features grilled salmon and whitefish, artisan vendors along Trinity street, free live music all day. Make sure you take the free tour of the lighthouse. It's a working lighthouse and it's only open to the public once a year. You can hike up Trinidad Head or catch the shuttle to the top. Round trips start at 11:00 AM, end at 3:00. Fine Art Printmaking, Painting, Photography, Drawing & Collage. Patricia has studied at the School of the Museum of Fine Arts, Boston and Rhode Island School of Design, and engaged in private textile and surface design studies in Berkeley. Her artwork incorporates a wide range of printmaking techniques, including mezzotint, etching, collograph, lino block, relief and monoprint. She also enjoys working in collage, painting and photography. 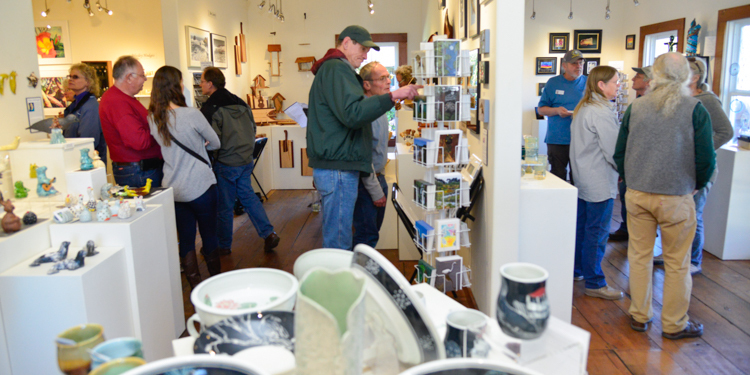 Stop by and meet our member artists. Trinidad Art Nights begin on Friday, May 2. We will be open from 6-9pm, with live music and refreshments. 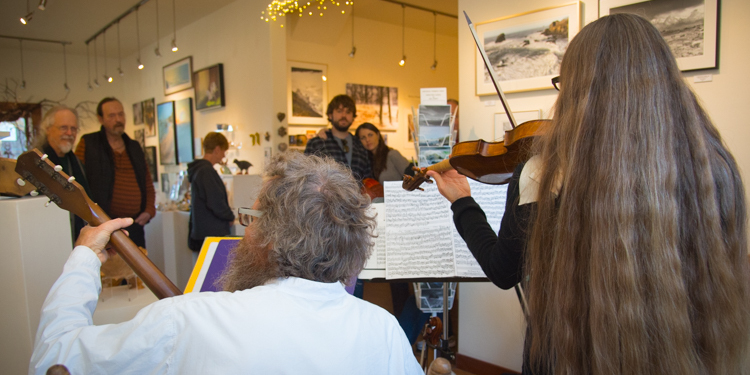 Art Nights are held the first Friday of each month, from May through October. Elaine Y. Shore is the Featured Artist for December. She will also be at the Humboldt Artisans show and sale at Redwood Acres, the Turf Room, December 6-8, 2013. 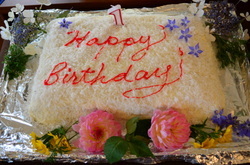 Yes, we just celebrated our first birthday. Thank you to everyone who came to celebrate with us. Onward to our second year! 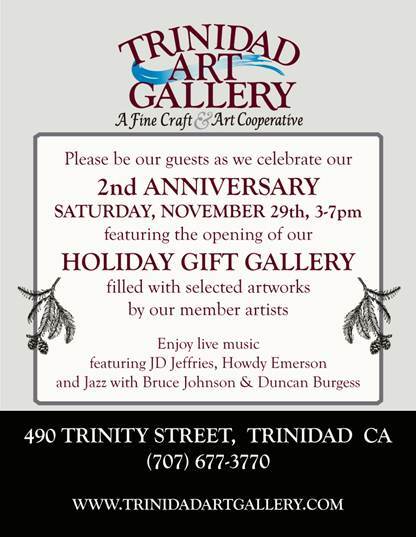 Sunday, November 17th, the Trinidad Art Gallery is celebrating our FIRST ANNIVERSARY with a party at the Gallery, from 1 - 4pm. We'll have food, refreshments and music. We'll have gift certificates for some lucky folks, too. We would like to thank the community for all the support we have received throughout the year. DECEMBER FEATURED ARTIST: Elaine Shore will be the featured artist for December. She is a ceramic artist, creating high-fired functional porcelain and stoneware pieces. Check out her work here. December 15th: CHRISTMAS IN TRINIDAD. The entire town of Trinidad will be decorated and shops will be open all over town so that you can get your holiday shopping done early. 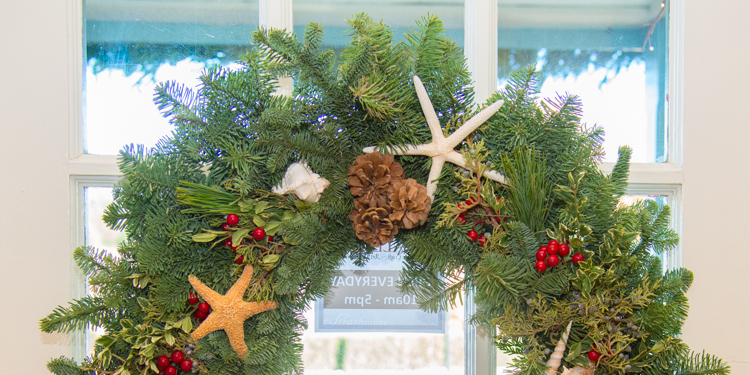 The gallery will have special holiday items in all media for sale.